I live for the day when we will no longer need titles like those on today’s post as inclusion should be the norm. Until then, breaking down barriers requires awareness. Ashley Nemeth, friend and featured Woman On The Move was recently asked to be a judge for a beauty pageant. I was thrilled when I saw the article about Ashley because she is an advocate working tirelessly to break down barriers. 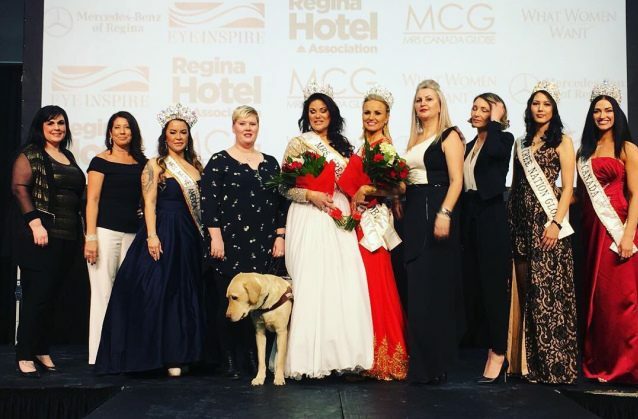 For the first time pageant, organizers of the Mrs. Canada Globe 2018 asked a blind person to be a judge. In her own words, Ashley talks about her experience as Blind Judge for Beauty Pageant. Way to go Ashley!! Lined up on stage are ten women, five are wearing evening gowns, pageant sashes, and crowns. Two of the five are holding red paper-wrapped floral bouquets. Ashley and Rick (her guide dog) are fourth from the left standing next to the two women holding bouquets. As you said it should just be the norm!